A screening of recent films by Sarah Pucill. The filmmaker will then be in discussion with Dr Margherita Sprio, University of Essex. The most recent themes in Pucill’s work have focussed on the relationship between an exposing of the film making process alongside a performance in front of the camera. The discussion will explore three of her most recent films, Taking My Skin (16mm, B+W, 35min, 2006), Blind Light (16mm, Col, 21mins, 2007) and Fall In Frame, (16mm, 18mins, 2009). Each film examines the power of the gaze between a mother and daughter (TMS), the sky (BL) and in a mirror (FIF). Pucill has been making films for 20 years. Her films have been screened in art galleries and at film festivals and have received funding from the Arts Council, The AHRC, and London Production Fund. Taking My Skin won the Marion McMahon award at Images Festival, Toronto 2007 and was screened in New Jersey University Gallery in ‘Mother Cuts’ and Fieldgate Gallery London. Blind Light was screened at European Media Art Festival at Aurora Festival, Norwich, and at the Louise Blouin Gallery in 2008. Fall in Frame was screened at Montreal Festival of New Cinema in 2009. A retrospective of her films premiered Fall In Frame on a US tour in 2009 at venues including Anthology Film Archives, NY, Pleasure Dome, Toronto, and LA Film Forum. Dr Margherita Sprio is currently a lecturer in Art History and Film in the Department of Art History and Theory at University of Essex. After studying Fine Art at Goldsmiths and The Slade School of Fine Art, all of Dr Sprio’s research interests have been driven by issues of difference across the fields of film/screen-based media and contemporary art practice. After working internationally as a practicing artist, she moved into teaching within an Art History/Theory and Film Studies context. She is currently writing a manuscript called Contemporary Art and Film that explores the continued relationship between art and film history and it addresses how film makers such as Sarah Pucill and John Maybury, (amongst others) navigate their own practice in relation to contemporary debates about visual culture. Serpentine Cinema: CINACT is a series of monthly artists’ film screenings and events at The Gate cinema in Notting Hill. CINACT takes its name from American artist Henry Flynt’s 2007 cinema manifesto. Each programme focuses on two artists who investigate and experiment with the medium of cinema. Amy Granat will premier two new films and we are delighted that Melvin Moti will be joining us to screen The Prisoner’s Cinema. The Prisoner’s Cinema (2008, 35mm), is named after the term used for visions of coloured lights and abstract patterns reportedly seen by prisoners or pilots after long stretches of visual deprivation. Moti’s protracted, mesmerizing film explores this phenomenon with the projection of subtly changing light filtered through a stained-glass window, while a scientist’s voice narrates the visions she experienced after many hours in a darkened room. Melvin Moti, born in Rotterdam in 1977, studied at the Academie Voor Beeldende Vorming in Tilburg from 1995 to 1999 and worked at De Ateliers in Amsterdam from 1999 to 2001, where he now teaches. In 2006 he received the Charlotte Köhler Prijs and the J.C. van Lanschot Prijs. His works have been shown at the Frac Champagne in Reims, the Stedelijk Museum in Amsterdam, the Kunstverein Köln and elsewhere. He recently participated in the 5th Berlin Biennale. He lives in Rotterdam. For the 2010 Portland International Film Festival Cinema Project brings a selection of contemporary film and video from Japan, Malaysia, and Taiwan. Focusing on natural and man-made structures and the spaces in-between, each of these works reveals a variety of dynamic relations from frame to space and from history to environment. 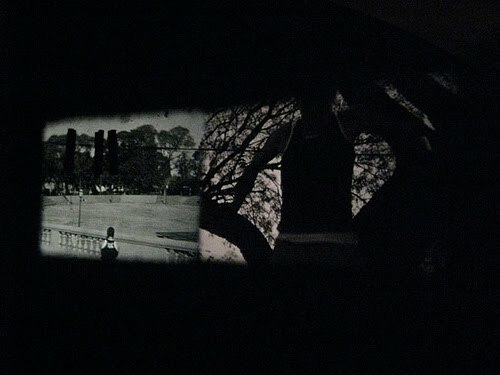 Daichi Saito’s entirely hand-processed film Trees of Syntax, Leaves of Axis examines the natural language of a familiar Canadian landscape while Chris Chong Chan Fui’s modernist exchange on public and private space in Block B presents a surprisingly telling view of an apartment block in Kuala Lumpur. From Tomonari Nishikawa is Lumphini 2552, black-and-white images of plants and trees shot using a 35mm still camera at Bangkok’s Lumphini Park. The result is a surprisingly emotional construction of rhythm and movement. And from Shiho Kano's Shinonome Omogo Ishizuchi is a transcendental travelogue inspired by filmmaker Mansaku Itami. Finally, Taiwanese filmmaker Chen Chieh-Jen’s Empire's Borders I examines the process that Taiwanese citizens endure when applying for a United States visa. Artist Ben Rivers presents a double-bill featuring films by Jeff Keen--hero of British underground cinema--and dreamy Bela Lugosi vehicle White Zombie, described by Keen as "possibly the most beautiful film ever." This programme in two parts presents a selection of videos by young artists (filmmakers and videomakers) who all of them work from existing material: found-footage, archives, images of all kinds and all backgrounds. Here, the practice of recycling, of reappropriation, of reuse is both an artistic gesture (creating a new meaning from two juxtaposed elements), social criticism, ability to retrieve data (Internet) and economic constraints (it is a 'practice poor' of cinema as Y.-M. Mahe said in his interview). One Minute Volume 3 follows on from One Minute Volumes 1 and 2 and features over 30 artists at varying stages of their careers. An eclectic range of moving image and includes works whose original formats include 16mm film, Super 8 film and video using approaches such as stopframe animation, superimposition etc. Yet all the works have one thing in common, they are constrained by a time limit of sixty seconds. Expanded Super-8 and 16mm cinema focussing on organic, experimental and intimate, life portraits of traceurs. Films by Christopher May. Show curated by Stefan Grabowski and Mariya Nikiforova. Portrait of traceurs in their favorite places. Bio: Christopher May's 16mm and Super-8 film work currently explores sensually visceral qualities of cinema and their topographical relationships with sub-cultural landscapes. His films have screened at Yale University, the Austrian Film Museum, and MALBA - Museo de Arte Latinoamericano de Buenos Aires. Christopher May's 16mm and Super-8 film work currently explores sensually visceral qualities of cinema and their topographical relationships with sub-cultural landscapes. His films have screened at Yale University, the Austrian Film Museum, and MALBA - Museo de Arte Latinoamericano de Buenos Aires. Tickets: $10 general admission; $8 members, students, and seniors. The Institute of Contemporary Art/Boston (ICA) presents a new edition of TIE, The International Experimental Cinema Exposition – a one-day screening of experimental films by innovative and renowned avant-gardists on Saturday, Feb. 20, 2010 at 1:30 PM. This two-part program, curated specifically for the ICA, illuminates the continuing vitality of experimental cinema with 16mm and 35mm films, several of which are world premiers. The show includes a section of films by Boston artists. Filmmakers in both parts join TIE curator, Christopher May, to answer questions. Open daily 10am – 5.30pm. Closed: 1 - 6 April. For the first time in the 18-year history of the RCA Curating Contemporary Art MA programme, final year students have decided to present a solo exhibition as their graduate project. Opening on 19 March, this will be the largest UK show by the pioneering East London based artist and filmmaker John Smith. Much loved for their wit, formal ingenuity and use of storytelling, Smith's films are as much influenced by the humour of Monty Python as the theories of avant-garde filmmaking. Acknowledging that much of Smith’s work has rarely been shown in a gallery context, a comprehensive selection will be shown together in the RCA galleries. This exhibition offers an opportunity for Smith to return to the RCA where he began making films as a student in the 1970s. The artist will work closely with the students to create an exhibition that reveals the multiple sensibilities which run throughout his practice. Rarely seen early films will be shown in the company of more recent work and the exhibition design will emphasise the narrative and structural devices used within Smith’s work. A programme of talks and events will complement the show, providing a focused, in-depth reflection upon individual works. Accompanying the exhibition will be a new catalogue on Smith’s practice with critical texts, an extended interview with the artist and a visual essay. A second publication will follow in June focusing on the solo show as an exhibition format. Comprised of research through interviews and historical analysis it will also reflect on the making of the exhibition and include documentation of Smith’s work.